Coat chops with jerk seasoning; set aside for 5 minutes. Meanwhile, microwave jelly, pineapple juice and ginger on High for 30 to 60 seconds or until melted. Grill pork over medium-high heat for 5 to 6 minutes per side, turning once. Baste frequently with glaze. During last 3 minutes of grilling time, place pineapple rings on the grill. Baste with jelly mixture. Grill pineapple until heated through. 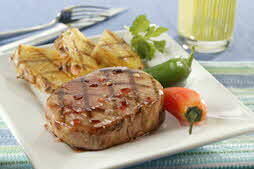 Serve pork chops with pineapple. Add tropical flair to the family dinner table with Fiery Island Pineapple Pork Chops. A favorite temptation from Great Falls, Montana, Edwina Gadsby's second place "No Recipe" recipe contest winner is sure to entice your family's appetite.